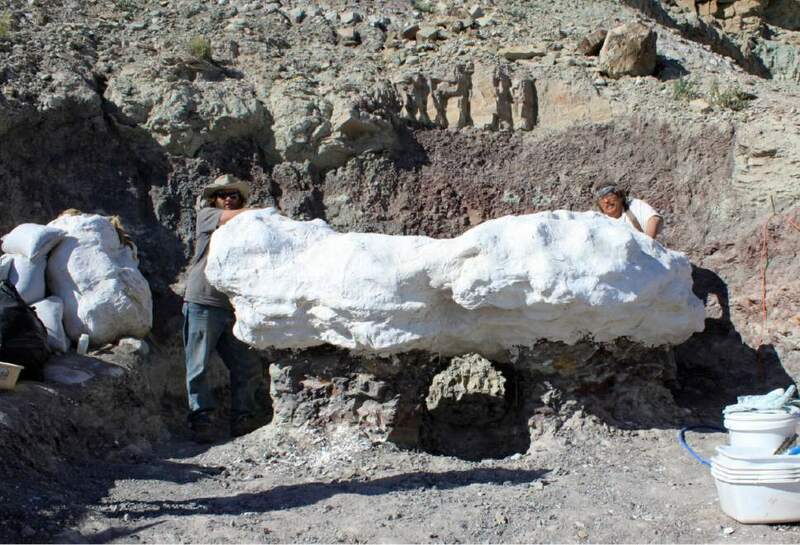 (Courtesy | Utah Geological Survey) In this 2014 file photo, Utah state paleontologist Jim Kirkland, right, is pictured with volunteer Howard Finn as they help excavate this nine-ton block of sandstone containing fossilized remains of numerous Utahraptor fossils north of Arches National Park. Kirkland will kick off the Green River Rock & Mineral Festival on March 31 with a lecture on the area's spectacular dinosaur fossils. Few places on Earth offer geology as interesting as that found in Utah. From the Colorado Plateau to the basin and range of the West Desert to the Wasatch Front, the display is almost unmatched in its variety. And this doesn&apos;t even include the dinosaur fossils found in the state. The tiny town of Green River on the Emery-Grand County line will be doing just that when it holds its Rock and Mineral Festival on March 31 to April 2, with the John Wesley Powell River History Museum serving as its base. The event includes speeches by experts, field trips, self-guided geology tours, a craft fair and vendors. There are kids events and a bonfire on Friday night. The kickoff event is a lecture with Utah Geological Survey paleontologist and geologist Jim Kirkland, a world-renowned dinosaur expert. Guided field trips Saturday, April 1, include a trip to Fossil Point, a Jurassic fossil bed 12.6 miles from Green River, and a trip to the Mill Canyon Dinosaur Tracks site with Bureau of Land Management regional paleontologist Rebecca Hunt-Foster. For information on the event, visit http://www.greenriverrocks.com.